I hope you all enjoyed my last post, in which I hopefully showed you how I implement emotion into my writing and try to make the reader feel what I feel, take them there with me, in fact. In keeping with this Harry Potter type theme, (I’m afraid insane fan girl doesn’t even BEGIN to describe my feeling towards J.K. Rowling’s epic masterpiece) today, I’m going to share with you my first attempt at an epic poem. I wanted to see if I could take seven books, accompanied by eight movies, and trasnform them into a poem that had just as much feeling, suspense, granduer and poetic grace as the series. I hope you enjoy it, I’d like to think of it as my tribute to JK’ Rowling’s wondrous work, and as always I would very much like to hear your thoughts, opinions and criticisms. Happy Reading, let your writer be your guide, and don’t be afraid to lose yourself, and indeed find yourselves in a story. 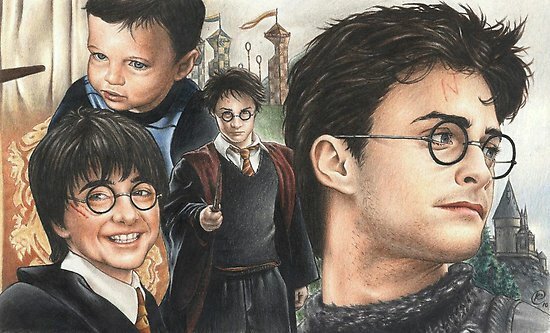 Now, watch before your eyes as A Boy Who Lived becomes a Legend. Ten years ago as we well know…. a boy became a wizard in The Socerer’s Stone. A year older then, wand raised with no regrets, he boldly took on his darkest enemy in The Chamber of Secrets. Daunting dementors, and taunting rivals, whirling at him in the third year at hand, he uncovered the past, and discovered a man, a Prisoner of Azkaban. To the Dursley’s he never did wish to go back, once met he his godfather, the noble Sirius Black. Fighting dragons, rash wild branches, and mermaids in the toss and toil of black waves, not to mention a twisting tangle of a maze, was naught compared to what young Harry would face upon being stolen away to a forlorn dark grave. Losing dear friend, a most horrid sight to see, t’was the wrongful end of dear Mr. Diggory. So happened this ressurrestion of a dark enemy’s ire, how Harry did suffer at the whim of The Goblet of Fire. Age fifteen, no longer a boy but a man, Harry is haunted by dreams from a most pale, deathly hand. Oppressed by authorative tyranny, such wretched pink villainy, He stood up against a sickly sweet horror, with an army of friends named for his hero Dumbledore. Loss struck him yet again, as noble Sirius Black met his untimely end. Shattered, and broken, he sought revenge, yet instead found a token that would pit him once more, against the monster of a man who murdrous murders adored. Neither can live, while the other survives, one must prevail, as the other dies, Harry Potter so painstakingly picked, to save the wizarding world in The Order of the Phoenix. Dear chosen one, facing the trials and triumphs of love, wonders what awaits him as sixth year comes. An old school foe, fallen from his playful arrogant ways, treads ever more into darkness, with a poisonous plot at play. Eaters of death, mark the young aristocrat as their own, as an evil power ascends higher to the throne. A dark lord rises, a great wizard falls, a surprise assassin, a daunting call. Harry’s screams echo in that hallowed hall, lost so many loved, now the man who taught them all. The true pain of impending hardship hits, darkness decends at the doings of A Half Blood Prince. Forced into hiding, the hero’s disguise cloaking his many friends, they do fly off to safe digs, yet is lost a funloving flighty fowl, his faithful owl, Hedwig. All that is familiar is lost, very lives could be the cost. A snapped wand, a frozen pond, same mind, different faces, unfamiliar lonely places. A row with a red-haired weasely, always moving, searching for soul pieces, no one said it would be easy. A child’s story could so cleverly hold a living mystery, a stone, a wand, a cloak owned by the Pevril Brothers Three. The search thickens, yet Harry’s heart quickens, as he is brought to a place he longed to avoid. The sprawling mansion owned by the family of Malfoy. Torture and tears, realized fears, threats and argument of a sacred sword, not to mention a death that left them sobbing, everyone forced to bid farewell to a helpful house elf named Dobby. Horcuxes hunted, an dangerous race run, who can predict what is to follow, death can be mastered only by he, who possesses the Deathly Hallows. Deathly Hallows: The End is Near! Wizard & Muggle Alike Unite!